According to the Lee County Sheriff’s Office, Trey Young, 25, entered Canteen Vending and struck several co-workers. FORT MYERS, Fla. -- Attacked at work! 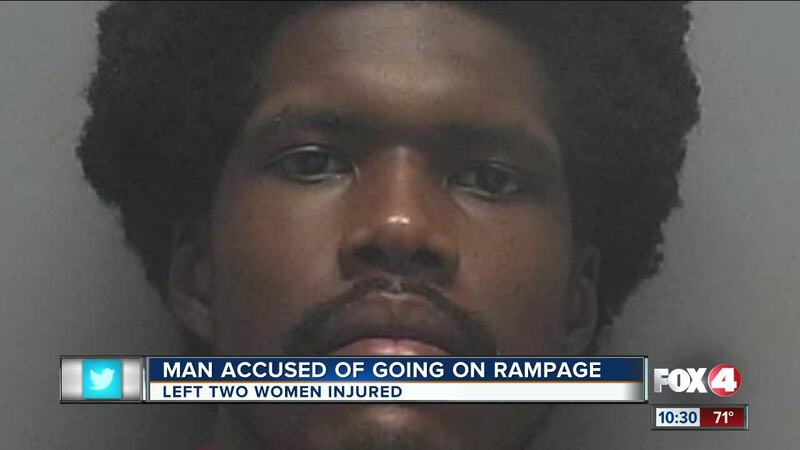 A Fort Myers woman is recovering from injuries after a terrifying ordeal in which her co-worker is accused of getting violent with her and then trying to carjack another woman and making off with a company truck. Jamie Bader's daughter is going to be okay. But on Monday, she got a call from her daughter and she could barely understand what she was saying. It was a muffled, short-breathed “I’ve been punched”. “You want to just wrap your babies in bubble wrap, put them in your bed and never let them go. You always want to protect them”, Bader said. She never thought her daughter’s job would become a place of harm. According to the Lee County Sheriff’s Office, Trey Young, 25, entered Canteen Vending on Monday and struck several co-workers. Bader says her daughter, Katie, is an employee at Canteen. While she was waiting in the car with her boyfriend, she told her mom that Young threw his sunglasses at the car. Her window was down, and Bader says that’s when he leaned into the car and punched her in the head. That punch left Katie with a concussion. Deputies say Young’s rage continued down the street, with a stop at Modern Services Air Conditioning, where he attempted to carjack a 57-year-old woman. According to a report, an employee saw the attempt, and jumped out of his company car to help the victim. Young was able to get free, jumped into the company’s vehicle and take off. That vehicle had GPS, allowing deputies to locate Young and engage in a chase. Deputies were able to safely stop Young utilizing a PIT maneuver. LCSO says they also received two other calls involving Young, including an attempted break-in at a Fort Myers home - smashing one of its windows with a ceramic pot. Young is currently in custody facing 13 charges, including burglary, battery and robbery. Fox 4 spoke with Modern Services. They said they'll provide more details on the incident on Wednesday. The Lee County Sheriff's Office says the woman involved in the attempted carjacking was injured and transported to Lee Memorial Hospital. Her condition is unknown.